The Sons of the Revolution in the State of North Carolina, a social, literary, and patriotic society, was organized by ten men who met at the state library in Raleigh on 25 Oct. 1893. Membership was limited to men 21 years of age and older who were lineal descendants of active participants in the movement for independence during the Revolutionary War. Participation was defined as being such that might have subjected one to trial for treason by the British government if the war had been lost. At the first meeting Governor Elias Carr was elected president of the society; among the other officers were Kemp Plummer Battle, Marshall De Lancey Haywood, Daniel Harvey Hill, and Samuel A. Ashe. Carrying out the objectives of the society, members undertook to install portraits of revolutionary leaders in public buildings, to present programs on anniversaries of significant events, to mark notable historic sites, to encourage the study of history in the state, and otherwise to keep alive knowledge of the role of the state in attaining independence. 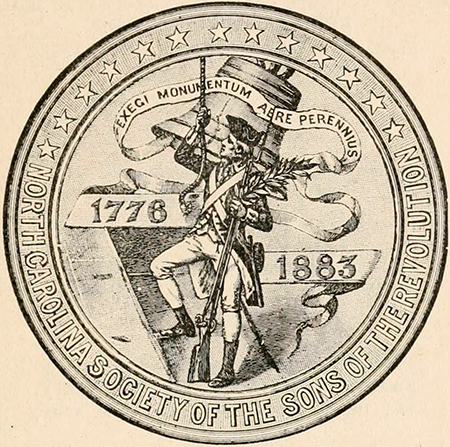 James Vann Comer, Sons of the Revolution in the State of North Carolina, Inc., and Its Predecessor: North Carolina Society of the Sons of the Revolution (1990). Sons of the Revolution in the State of North Carolina. "The membership and ancestral register, by-laws and charter of the North Carolina Society of the Sons of the Revolution, including also the constitution of the General society, etc." Raleigh, [N.C.]: Edwards and Broughton. 1898. http://archive.org/stream/membershipancest00sons#page/n5/mode/2up (accessed September 21, 2012). Sons of the Revolution in the State of North Carolina. By-laws of the North Carolina Society of the Sons of the Revolution and charter of the same to which is prefixed the constitution of the general society and containing amendments in force up to 1908. Raleigh [N.C.]: Commercial Print. Co. 1909. http://archive.org/stream/bylawsofnorthcar01sons#page/n5/mode/2up (accessed September 21, 2012). Hamilton, J. G. de Roulhac. "Presentation of portrait of Governor Abner Nash to the State of North Carolina in the hall of the House of Representatives, at Raleigh, November 15, 1909, by the North Carolina Society of the Sons of the Revolution." 1909. http://archive.org/stream/presentationofpo00hami#page/n1/mode/2up (accessed September 21, 2012). Carr, James O. "Presentation of portrait of Governor William Richardson Davie to the state of North Carolina : in the Senate chamber at Raleigh, November 15, 1910." Raleigh, N.C.: Commercial Printing Co. 1910. http://archive.org/stream/presentationofpo41sons#page/n0/mode/2up (accessed September 21, 2012).